Burns' Night is over for another year and as alway I have loads of Haggis left over. Only me and Harry like haggis in our house so even with one haggis we usually only end up using half. I decided this year to make Haggis Scotch Eggs with the left overs. 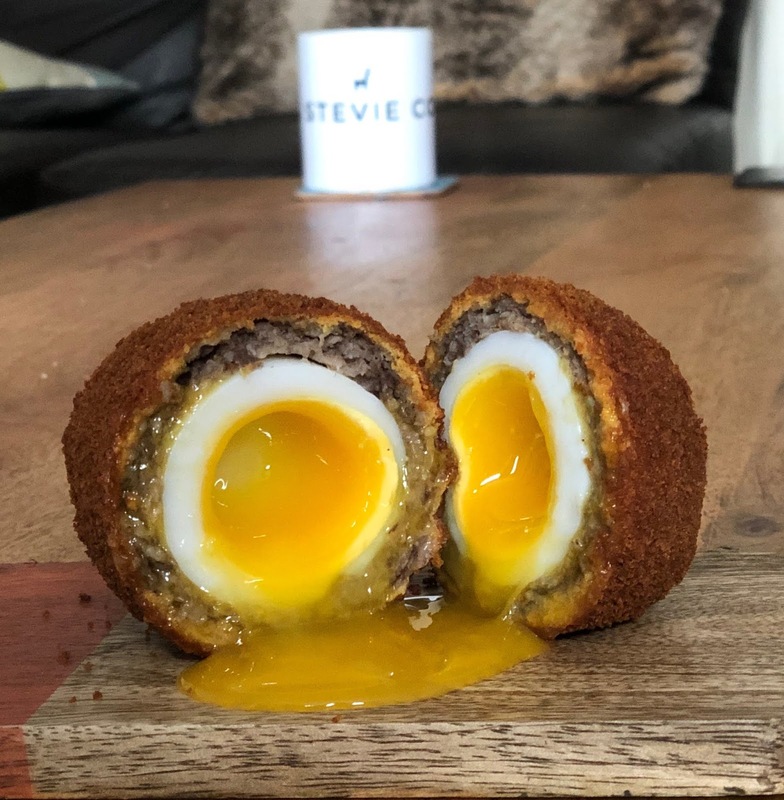 I've tried to make scotch eggs only once before and it was a bit of a disaster, the yolk was hard but the sausage was undercooked. This time I learned from my mistakes and have to say I was pretty impressed with these ones. For these you will need. I use duck eggs as they have a bigger yolk so it will stay runny longer, boil them for around 7 minutes and then immediately put them cold water to stop them from cooking. Next mix Haggis and Sausage meat together. You want 60% haggis to 40% sausage meat. 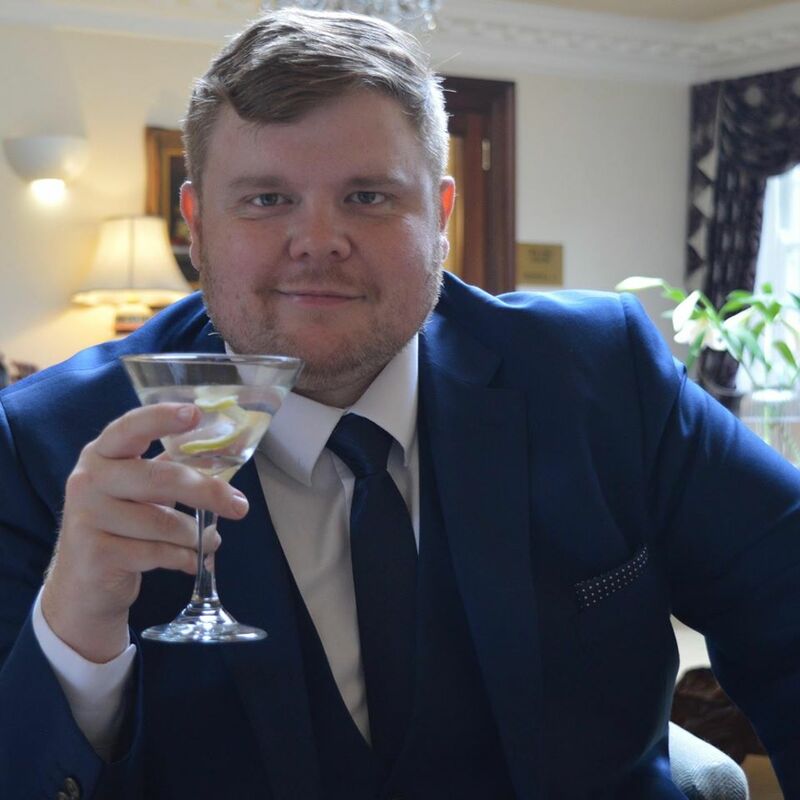 Lay a piece of cling film on your work surface and put a ball of the haggis/sausage about the size of a golf ball onto the film and roll it out flat (about half a centimetre thick). 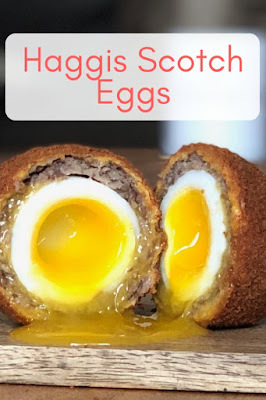 Peel the cooled egg and place it in the middle of the meat and using the film bring the meat around the egg, seal the edge together with your fingers until it looks like a giant meatball. For the breadcrumb coating you will need 3 bowls, one with flour, one with a beaten egg and one with the breadcrumbs. Roll the meatball in the flour and shake off any excess, then roll it in the egg and then in the breadcrumbs. I like to repeat the the egg and breadcrumb steps a second time as it makes the coating extra crunchy once it's cooked. You need to heat a deep fat fryer to 180º-190º, pop the egg into the oil. Cook it for 4 minutes and then turn it over and cook for a further four minutes. Once cooked leave it to cool for a couple of minutes on some kitchen paper and then serve immediately and you should have a perfectly runny yolk. If you prefer a firmer yolk leave the egg to rest a bit longer as it will continue to cook until you cut it open.